I talk to people about eating healthy a lot. Like pretty much every day, and anywhere I go. Just two weeks ago I was getting my daughter’s hair trimmed and I thought it would be a good time to talk the lady’s ear off about pesticides and GMO’s. I pretty much take any chance I get to spread awareness about the issues that matter to me most. In the most loving way I can though, of course. Because I know you can attract more flies with honey, than vinegar. I wish more people knew that actually. Because I so see many people out there fighting for issues that are close to their hearts, but going about it all wrong. When people are aggressive and hateful about the issues they are passionate about, it turns people away. It can often hurt their cause more than it can help it. But when people speak about their passions from a place of love, and talk about their issues with solutions, you can get so many more people to listen, and even more to offer their support. At least that’s been my experience anyways. I’ll give you an example. I went to the beach a few weeks ago and while we were there a lady starting yelling at a bunch of different people on the beach. She was yelling at people for spraying aerosol suncreens that are proven to harm the ocean reef, and also shown to cause cancer but that’s a whole ‘nother subject for another day. Although her heart was in the right place, her message wasn’t being heard by the people and surely wasn’t taken seriously because of the way she was going about it. The people were going to leave that day remembering “the crazy lady on the beach” instead of leaving with a new awareness about suncare products and our ocean. She was expressing one of her passions through hate and anger and in return, she received hate and anger towards herself. She was cussing and raising her voice at teenagers and around children, and in return, the people on the beach stood up against her and told her to get out of there and leave them alone. Now if instead of calling people names, raising her voice, and screaming at people for “killing the reef” and “causing cancer” she had gone over to them with love, and shared kindly that although they might not realize it, there is a government study that shows that a common chemical found in many sunscreen lotions is highly toxic to corals and other marine life, and that they could kindly stop spraying it, and in the future choose a reef-safe product next time they shop. I’m sure they would have responded in a much different manner. Having a nice woman come up to them to share a kind message out of respect for themselves, and compassion for the environment would have left them feeling much different that day I’m sure and made a much greater impact toward her cause. That’s also kind of how I feel about eating healthy. You can’t force it upon people, you just can’t. I guess that goes for anything. But when I hear people say things like “I could never eat raw vegan, I just couldn’t” I just can’t comprehend how anyone could come to that conclusion. Don’t get me wrong, I’m not raw vegan, but if I wanted to be– I could. Lol! I certainly love raw foods, and eat a lot of raw vegan meals. But I also find there are benefits for my family to eating meats and cooked foods too though. I personally like to experience the best from both worlds. Plus, I think with anything, don’t knock it until you try it. You can’t judge something you’ve never experienced, well not accurately anyways. I think the reason people think eating healthy tastes gross is because the healthier processed foods sold at the stores usually taste horrendous. But when you make foods yourself with the best, most nutritious, freshest, whole food ingredients you can find, it’s nearly impossible to go wrong. As long as you know what you’re doing, or have a recipe that is. And practice makes perfect! I try to keep my recipes super simple. Most of them are just like this one, pulse in the food processor for 3 minutes. And blend a bunch of stuff in the blender for 2 minutes. Pour and freeze. Or bake. I keep it really simple, and I promise you, eating healthy does not have to be complicated. Nor taste disgusting. It can be the easiest, and most delicious thing you’ve ever done. Also, one of the most gratifying and satisfying too. If you or someone you know is hesitant about eating more raw vegan foods, start with something sweet like this. And I promise you, if you made this for a pot luck or a gift for someone, if you didn’t tell them it was Raw Vegan, Paleo, or super healthy, they wouldn’t even know. Heck, it tastes soo good they probably wouldn’t even believe you! 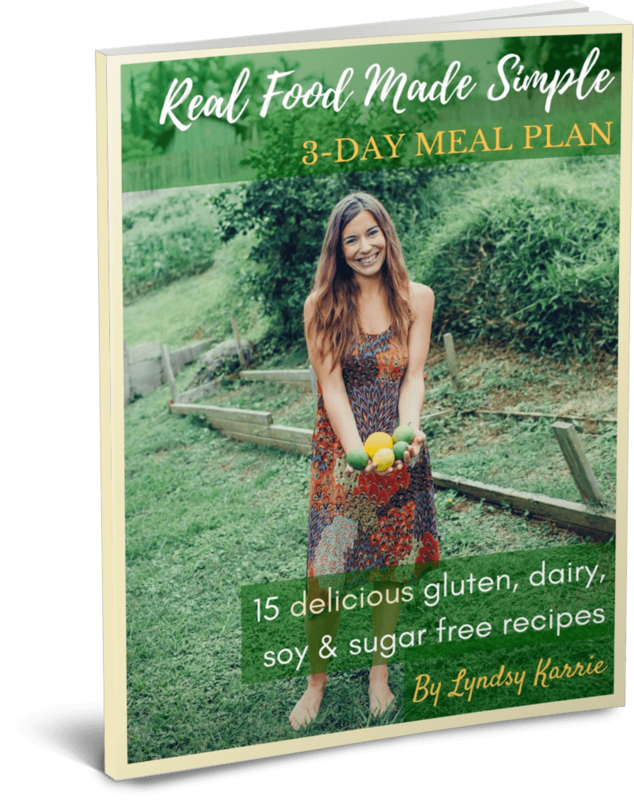 And if you like this, you’ll love my Real Yummy Desserts book with over 30 of my best, most nutritious & delicious simple real food recipes. From 5-minute raw fudge, to edible cookie dough, cheesecake nice cream, and everything in between, you’ll be stoked to find out that eating healthy can be so incredibly delicious!! Click here to check it out! Create healthy habits, not restrictions! Pulse the walnuts and shredded coconut in the food processor for about 2 minutes or until ground. Stir the mixture around and add the 2 tsp. of raw honey. Pulse again until completely mixed together, about 1 more minute. Cut out a round piece of parchment paper for the bottom of a 9-inch glass pie dish, or slather with some coconut oil so the pie doesn't stick to the bottom. Press the crust to the bottom of the pish dish evenly. Throw all filling ingredients into a high-speed blender, and blend together until completely pureed and smooth. Pour filling on top of the pie crust and smooth evenly. Place the pie back in the freezer for about 3-4 hours or until it reaches your desired consistency. Top with sliced bananas or strawberries if desired. Enjoy! OMG, this looks amazing! Going to make this weekend, thank you for sharing! !